The Bighorn River in Wyoming below the "Wedding of the Waters" has real trophy fish. The Bighorn is the Wind River (they were just explored from opposite directions and named differently). They don't all sip tiny dry flies there, but sometimes they do. They don't all smash streamers, but sometimes they do. In any given season there is something for everyone. We find that everyone loves this float. We believe that you should have an extraordinary experience. 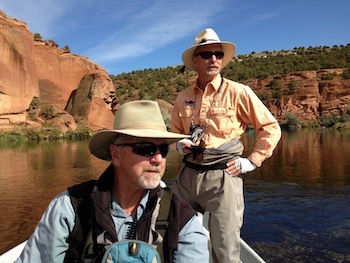 Our guides are friendly, courteous, and patient, not to mention excellent instructors and interesting people. In our Clackacraft driftboat you can cast in leisure on this underestimated gem of the state of Wyoming. In the spring, when water is high, it is often nymphs and streamers. Summer often brings the hopper or chernobyl with the dropper. And fall can bring pods of rising fish to baetis and tricos. We have come to realize that we enjoy fishing dry flies and that we are good at teaching the nuances. Come join us for some fishing that takes your breath away! Click here for check list.